How lost can you feel in the countryside? According to Simon Longman’s new play, Gundog, a good deal. Longman’s rural family of shepherds are a sad lot. There’s Becky – school drop-out, couldn’t see the point of learning anything, `they don’t do lessons in shepherding’ – Anna, her older sister, quiet, monosyllabic, dependable. And Ben, their angry, troubled brother, who turns up from time to time having been away but forced to return. He has no skills, other than being on the land. And that’s their predicament. That’s all they know. The land. `Got all our blood inside it, hasn’t it? All that time. It belongs to us’, says Becky towards the end to Guy Tree, another itinerant, an immigrant from we know not where but eastern Europe by the sound of his accent. That’s clearly Longman’s nod to now and a scene between Ben and Guy reflects the ongoing tensions about immigrant workers that, we’re given to understand, were in part responsible for Brexit. Becky’s line should sing. It carries enough metaphorical weight conjuring as it does an image of the endless continuity of people to land. Longman can certainly produce a sense of Time’s wasted chariot; this is a family only too aware of their stationary position in the historical cycle. They’re in touch with the cycles of Nature like no other, with their sheep, the tupping and the lambing. It’s a brutal landscape alright; ewes die in labour, old farm dogs get put down and the shotgun is never very far away whether livestock or human life is concerned. 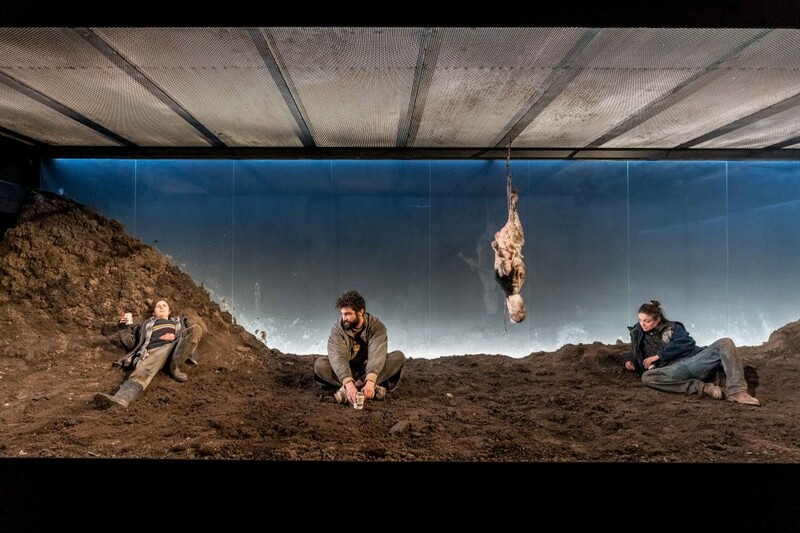 Chloe Lamford too creates a sense of morbid uselessness and harsh rural life with her mounds of earth and mud spattered backdrop suggesting blood and generalised dirt and grime. But something doesn’t quite gell. 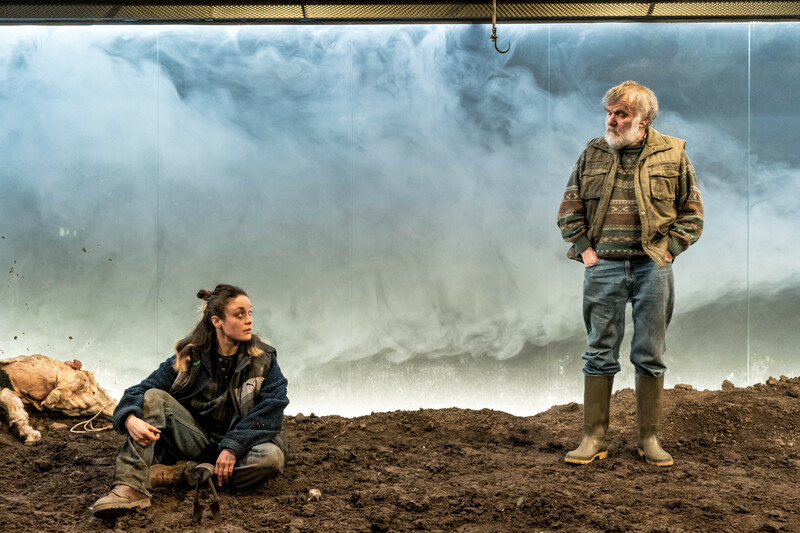 Edward Bond, Caryl Churchill, Robert Holman, Nell Lyshon, Barney Norris and Bea Roberts (And Here Come the Nightjars) have all laid down previous examples of agricultural and rural angst. Longman’s route is another exercise in inarticulacy, guilt and a numbing sense of ruination in the overarching silence, interrupted only by Vicky Featherstone’s crashing and whirrings that might be the sound of farm machinery or personal, existential inner explosions. Everything collapses under the fingers of this blighted family. The only hopeful sign is that granted by the outsider, Guy, who offers the observation that in all the time he’s been living in England, this family have only ever been the ones to ask him if he’s okay. It’s left to Alan Williams as Mick to provide the lynchpin of the production as granddad, going slowly potty and fully aware of his own mortal lifespan. Williams makes every word cherishable whether finding humour in the old man’s garish obscenity or pathos in his final elegiac summary on survival: `be brave’. 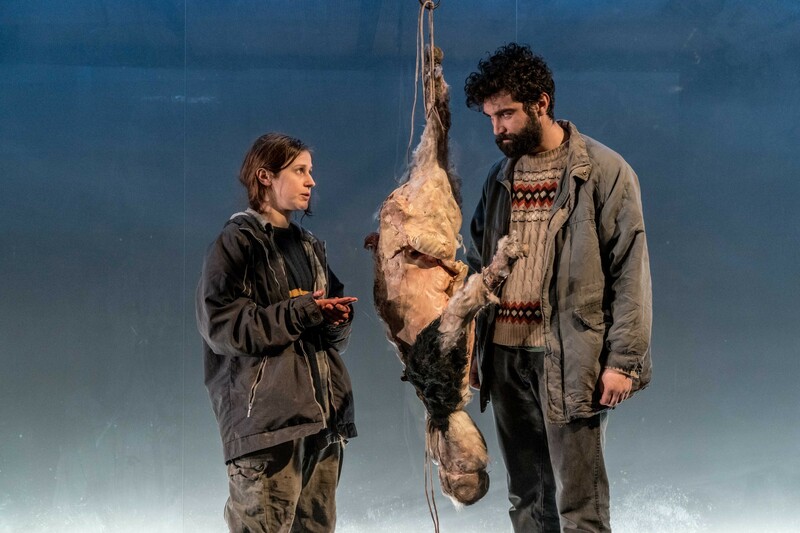 Rochenda Sandall as dependable Anna, Alex Austin as the demented Ben and Alec Secareanu as the sympathetic `other’, all contribute to an evening in which not just silence but time weighs surprisingly heavy. An interesting corrective to those soft-focus romantic images of rural equanimity, in the end, it doesn’t quite come off. But, like grandad’s homily to his family, Longman too has bravely tried to capture something of the eternal and intangible: human attachment to the land. 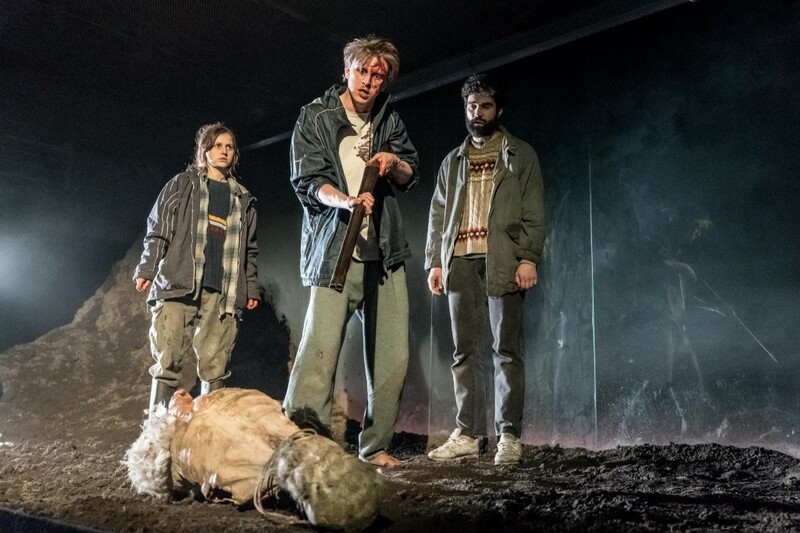 This entry was posted in 2018, Reviews and tagged Alan Williams, Barney Norris, Bond, Churchill, guilt, inarticulacy, Royal Court Jerwood Theatre Upstairs, rural angst, Simon Longman, Vicky Featherstone on February 14, 2018 by Carole Woddis.